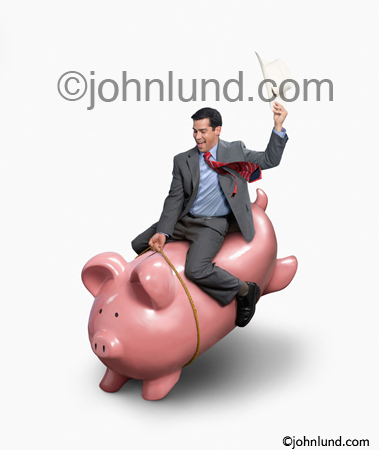 An iconic image of a piggy bank, illustrated in a new and different way, results in an effective and compelling stock photo about the risks and rewards of investment opportunities. There are images that have become so identified with certain concepts that they not only ubiquitous but have become clichés as well. These “iconic” symbols are ubiquitous and often banal, but even then retain the power to communicate effectively. Such images include the light bulb to demonstrate “ideas”, a life preserver for “rescue”, and a lighthouse for “guidance”. Another such symbol is the piggy bank. We see it everywhere, and we instantly know that the topic is finance of one sort or another. While we can look at such overused images as a liability, if they are portrayed in a new and interesting way they can be extremely powerful in getting a message across. What they have going for them is instant recognition; what goes against them is the boredom factor. Get rid of that “boredom”, show that symbol in an eye-catching and interest-provoking manner, and you have an image that serves your clients well, and in turn can bring in substantial revenue for you. A another example of a piggy bank image that does that refers to "Stretching Your Savings". In this case I wanted to create a stock photo that could be used to point out the volatility, the ups and downs, and the risks of finance markets, whether they are in savings, capital investment, the equity markets or any other financial instruments. I chose to use a man in business attire to expand the concept beyond that of personal finance and to include corporate entities as well. The cowboy on a bucking bronco is a concept that all Americans, indeed that the whole world is familiar with, and has an inherent drama to it. Success in that rodeo sport is possible, but is hardly a given. I think it is a perfect merger of two familiar and iconic symbols. Some of the things that make for successful stock photos are motion, or a sense of it, a positive spin, a clear message with a quick read, and effectiveness at thumbnail sizes. To impart that sense of motion we have dramatic body positioning for both the piggy bank and the executive riding it. Another detail that works to help add to the sense of movement is having the businessman’s tie flying out. We also made sure to have our model smiling to add that positive aspect to the photo. By having the image on white we make it easy for those licensing it to incorporate it into a wide variety of uses…and to expand the image to accommodate headlines and body copy. Generally images sell better when they are in an environment, but in this case my intuition was to use that more generic white background. This is the kind of image that can be used by a huge portion of the business and finance communities for everything from newsletter embellishment to bank adds to editorial illustrations. With that in mind I put the images into Blend Images Royalty Free collection to get maximum distribution and to avoid eliminating those potential users who avoid using Rights Managed images for real or perceived reasons of expense. Time will tell if the image turns out to be successful or not, but the principle works. If you can take one of those iconic symbols and show it in an interesting and compelling manner, then I bet that you will have, at the very least, one of those bread and butter images that are so important to having a thriving stock photo business. Great piggy bank image, John. Diane has some good ones up there also. One that Getty is using for their promotional stuff. Keep up the good work. Thanks Jim, I'll keep trying!